Asylum seekers: time to close the bloody camps! Arguably the biggest story on the Australian political scene last week was the protesters interrupting Malcolm Turnbull in a speech in a posh Melbourne hotel telling the Committee for Economic Development of Australia (ceda) that Good budget management is a vital component of our economic plan as if they didn’t know. Some of the demonstrators paid for their seats while others went in with the media. A protestor said later those who posed as media representatives gave false names. 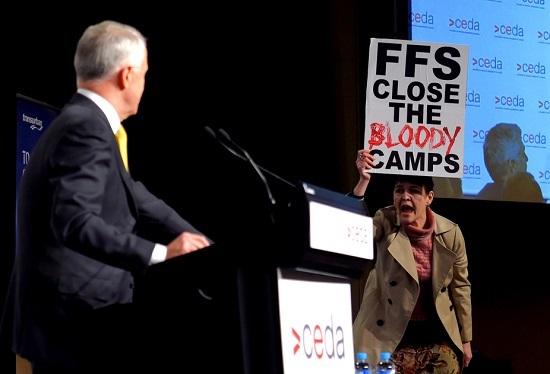 One woman reached the stage, where she stood, metres from Turnbull, holding a placard that read “FFS CLOSE THE BLOODY CAMPS”. It was not police but CEDA chief executive Stephen Martin who escorted her away. Protesters shouted: “Malcolm Turnbull, shame on you, shut down Manus and Nauru”. Turnbull was forced to stop his speech until order was restored. To recap, earlier we had a leak of 2000 reports on Nauru, revealing the “devastating trauma and abuse inflicted on children held by Australia in offshore detention”. Australia’s immigration minister, Peter Dutton, has accused asylum seekers of setting themselves on fire, deliberately self-harming, or making false allegations of sexual assault in order to come to Australia. Nevertheless he did say that every one of the 2,166 incident reports revealed in the Nauru files would be investigated, and there was a joint announcement with PNG that Manus Island would be closed, but no specifics about dates or what would happen to the 854 men warehoused there. Last Monday Communications minister Mitch Fifield told Q&A that there was ‘nothing systematically wrong with offshore detention,’ and that people smugglers will ‘have a product to sell again’ if refugees on Nauru are resettled in Australia. Back on 12 August four prominent ethical Australians, Frank Brennan, Tim Costello, Robert Manne, and John Menadue put forward A solution to our asylum seeker crisis. They are saying that there is no third country solution for the 1750 innocent people for which Australia is now, and will remain forever, morally responsible. Those who say that there is (they don’t say it, but Labor would be among them) are deluding themselves. They also say that the maintenance of the current boat turn-back policy will prevent the boats from starting again. Frank Brennan talked to Emma Alberici on Lateline about the further implications of taking this action, including the obligation to take more interest in what happens to refugees turned back and to establish regional arrangements that provide safety to those who genuinely need it without getting on leaky boats. Frank Brennan also told Leigh Sales that the purpose of Nauru and Manus Island is not primarily to send a message to people smugglers and asylum seekers, it’s to send a message to Australian voters. New Zealand has offered to help by taking 150 a year, but Turnbull has knocked them back. There’s more at Eureka Street. Guy Rundle goes further and says that Nauru and Don Dale define us (paywalled). We need to recognize that there is something callous and brutal in the way we treat people within the penal justice system. How many more clues do you need as to our character? We’re a white settler capitalist society, born in dispossession and genocide, and with a willingness to damn the excluded as unpersons, outside the civil circle. a liberal impulse to counter this trend (as well as a reactive backward trend), and from the mid-1960s, a fully progressive impulse. We may have started from a low base, many Australians tell themselves, but we have been heading in the right direction for a long time. But we do not move smoothly forward as one to a more egalitarian, fairer society. There has been a political-cultural undertow. Solutions that were put forward as the lesser evil to prevent deaths at sea have gotten out of hand. Essentially we’ll either have to stop doing what we are doing, or own it. Comedian Nelly Thomas says we are increasingly being sucked into blaming the victim for their own fate. Prof Andrew Markus has just completed a humungous survey into Australians Today, the multicultural society and all that. He has a chapter on discrimination, and found plenty, especially for Somalis and Muslim women. He told Patricia Karvelas that men were twice as likely to be intolerant as women. From memory, don’t quote me, that was 37% as against 17%. Turnbull was quite upset by having his meeting interrupted. 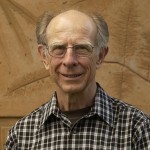 He should be upset by the reason the protesters thought their action necessary. The PNG courts made a decision about Manus Island, quite a while ago, which Australia must accept. Embarrassing. Next move, Foreign Minister? Any comment, Russell Broadbent?